Hello! 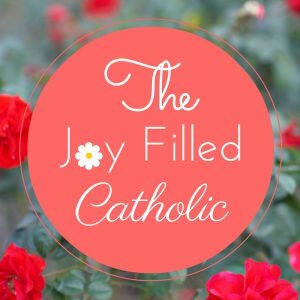 Welcome to The Joy Filled Catholic Blog. I am Christie, a joy filled Catholic, who, after being raised Catholic, attending CCD, and then Catholic School 7th-12th grade, drifted away from the Catholic Church and her teachings. I was what some call a “C&E” (Christmas and Easter) Catholic for many years and I slowly made my way back to the fullness of the faith, shortly after our twins were born. You’ll be able to read my story soon on the About Page, once I write it! The reason that I decided to begin this blog, is because God put it on my heart to do so. This blog has been in my heart and on my mind for the past year. In fact, I created all of my social media accounts last year but put my blog on the back burner. However, this blog is constantly on my mind. I hear something or I read something, and I think – “That would make a great blog post.” I sure wish I had written all those ideas down at the time – though I don’t think I’ll run out of topics any time soon! So what can you expect to read on this blog? Well, I’ll share a little about me and my journey – but more importantly I hope to provide YOU with information and resources to help you along your journey toward the Catholic Church. I also hope to provide information that will clear up some misconceptions that people have about the Catholic Church and her teachings. Though I have always identified myself as a Catholic, I didn’t adhere to, or think that I even agreed with the teachings. I don’t really go to church. I don’t agree with all of the teachings. I still like to have fun. I just stay Catholic because that’s what I know. …and on and on it would go. I shudder at the thought of things I said. The ways that I may have unknowingly lead people astray or gave them a false impression of the church. Looking back, I think I said these things in part because I believed them and partially because I wasn’t prepared to defend my faith against those I knew would challenge my beliefs. I know why I’m Catholic now. I know that the Catholic Church is the one Christ founded 2000 years ago. I know so much more than I did and I’m learning more about my faith than I ever thought possible – and I’m so excited to share it with you!